For many brides, the thought of including family pets in their big day isn’t even a consideration. While they love their pets, they prefer to keep them at home. But what about those brides who treat their pets like children? Is it considered “okay” to include pets on your big day? While many people frown at the idea of animals in a wedding, there are definitely ways to include them! Assign someone to pet duties and to your pet’s “doodies”. You will want to have one person to make sure your pet isn’t causing trouble! Also, this person can help get your little friend to the appropriate area to “relieve” them self! Determine what role your pet will play. 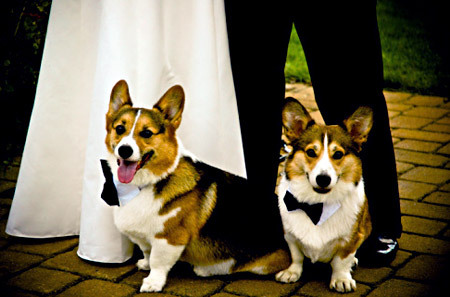 Will your dog be replacing the traditional ring bearer or will your cat be monitoring the guest book? This will help you give your assigned pet-person a better idea of their duties! Be considerate and let your guests know that there will be a pet in the wedding. Give them some time to reconsider taking that anti-histamine before they leave the house. Also, make sure your photographer is ready for pet photos. They may need a little extra preparation time. Make sure that your pets are groomed and looking their best! Also, consider if you want them be wearing attire of any kind. Have a backup plan and be ready to cut the pet’s part out last minute… Since you can’t reason with a misbehaving animal, it’s better to just move ahead without them than let them cause stress! This entry was posted on Wednesday, January 18th, 2012 at 3:32 pm	and tagged with Bridal party, bride, dogs, pets, Wedding You can follow any responses to this entry through the RSS 2.0 feed.